Tell Congress to SUPPORT H.R. 4214 (Compound 1080 and Sodium Cyanide Elimination Act). This has been reintroduced to the House of Representatives after President Reagan revoked the previous ban in 1981 choosing the interests of the livestock industry, worth about $160 billion annually, over public safety and humane predator control. After decimating populations of wolves, eagles, bears and black-footed ferret in the lower 48 states, two of the most dangerous poisons known to man - Compound 1080 and sodium cyanide – were banned in 1972 for killing predators on federal lands. The current bill, H.R. 4214, has been reintroduced to the House of Representatives after President Reagan revoked the previous ban in 1981 choosing the interests of the livestock industry, worth about $160 billion annually, over public safety and humane predator control. Today, Wildlife Services, a division of the U.S. Dept. of Agriculture, spends more than $100 million annually to kill about 1.7 million animals a year, tens of thousands of which are poisoned by Compound 1080 and sodium cyanide, as a subsidy to ranchers who claim predators and pests are threatening their choice of livelihood. While the livestock industry already gets handed hundreds of millions of taxpayer dollars every year in subsidies, Wildlife Services has declared on all-out war on native predators for the mere 5 percent of cattle deaths the USDA’s own audits claim were caused by wildlife. A 2008 article in Men’s Journal told the story of a man who accidentally set off an M-44 – a small trap filled with sodium cyanide – who came close to losing his life and now suffers lifelong health damage. The article pointed to the deaths of USFW biologist Sam Pollack and his dog from M-44 poisoning, as well as the unintended deaths of 1,184 domestic cats and 512 dogs in 2006 alone, as evidence of the risks posed by littering America’s wilderness with sodium cyanide. Compound 1080 is one of the world’s deadliest poisons – a teaspoon can reportedly kill up to 100 adults – of which there is no antidote. Deaths can take up to seven hours to occur, during which time the animal who has ingested the toxin suffers extreme and excruciating pain. Animals have even been found to have vomited up their own lungs. This poison is put into a rubber bladder and fixed around a sheep or goat neck using a toxic collar. When the bladder is punctured the poison is released into the unfortunate baited animal, the surrounding environment and any scavenger that takes a bite out of it. Collateral damage is often high and unreported. The second poison the legislation seeks to ban wreaks the same amount of havoc on intended predators as well as non-target species like fox, bear, dear and eagle. The M-44s are “spring-activated ejectors that deliver a deadly dose of sodium cyanide when they are activated,” according to Predator Defense, a predator advocacy group that had been working on reinstating the ban for many years. M-44s are primarily used to kill coyotes, but like all attractive bait laced with poison, an entire ecosystem could be affected as one animal consumes another, or the poison leaches into the water and soil. Ranchers have predator control options beyond potentially inflicting gruesome and painful deaths on wildlife, pets and people. Guard dogs, better fencing, penning the animals at night and devices meant to frighten predators all have been shown to protect livestock. But because the improvements are not being handed to ranchers for free as the taxpayer-sponsored widespread poisoning of wildlife is, they have no interest in making a long-term investment to better protect their food animals and in so doing be better stewards to the federal lands the government allows them to graze their animals on for free. 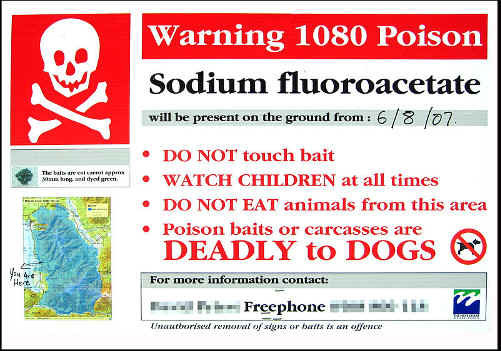 One of the biggest concerns to critics of Wildlife Service’s manufacturing, stockpiling and distribution of Compound 1080 is its risk of being used by terrorists because of the excruciating pain it inflicts and because no anecdote exists. The substance has been linked to Saddam Hussein’s chemical laboratory, and has been identified by the FBI and U.S. Air Force as potential bioterrorism agents. This news is especially disturbing as an audit of Wildlife Service from 2001 to 2004 revealed it lost track of poisons and had no database keeping tabs on its arsenal of potential biological weapons. The Compound 1080 and Sodium Cyanide Elimination Act would prohibit the use, production, sale, importation or exportation of Compound 1080 for any purpose, and prohibit the use of sodium cyanide for predator control.